Zhan was running through the forest as fast as possible, escaping the guards pursuing him. As he ran, he looked behind him and stuck his tongue out at his pursuers. They both had a look of worry dash over their faces quickly. When the impact against a hard something happened, Zhan realized why. "Ouch, that hurt!!" He shouted, punching the tree with all of his might. It left a large hole in the tree. The pursuers neared as Zhan struggled to free his right arm from the tree. When he finally did, they were right behind him. He turned and pulled his bo staff, swinging it at them both. It connected with one's forehead, and he went tumbling down a hill. Zhan landed a direct blow in the other's gut, who fell back into a tree, out of breath. "Haha!! LOSERS!!" Zhan shouted, darting farther into the forest. Finally Zhan reached the training area. "Stupid imperial advisors trying to make me study... I don't want to learn about the history of the Symbols..." He complained. "I'd rather train in body over mind, any day of the week!!" Ige's fist connected with his face instantly, ige was fast and silent he truely was a symbol of true power. Ige quickly pulled his fist back and kneed him in the stomach next as he disappeared and reappeared behind him with grimace on his face. Ige stood behind the boy as he was about to snap his finger as fire danced on the tips, "Foolish child, you may be the leader but intellegence is needed. I must however say that you aren't strong enough yet to skip studies if you didn't detect my presence. Your past reincarnated form was truely strong and earned the title of leader. I am Ige Hong Toufa, i am the master of fire the oldest symbol and the one to be reincarnated the least. I am the Vermillion Bird." Ige was serious which wasn't good most of the time, as ige snapped his finger fire circled the young boy and ige. Zhan felt impact, stronger than that of the tree hitting him. "OUCH!! What the HELL!?" He shouted. He saw someone in front of him, he looked familiar. Zhan had met Ige once before, but hardly remembered it. "You're that one guy...." He said. "And, I'm plenty strong!! You just caught me off guard, and I'm hungry... so I had a disadvantage!!" He lied childishly, not wanting to admit the other had more skill. Taking a look at the fire around them, Zhan sighed. "I...um...I can do cool things with rocks like you do fire!!" He shouted, yet doing nothing to show off. Now that I think, this guy is another one of the Symbols, like me, right? He recalled. "Wait, what's your name again, I forgot!!" He said, smiling innocently. Ige sighed as he made the fire rise higher and higher then the fire encircled the boy till it was barely an inch away from his face, "So childish you are, i know you have eaten no symbol goes hungry, also you heard my name i have no need to repeat it unless you have decided it has any importance about your studies. Also i have met you before though you showed much more promise then than now. I challenge you to a fight, if you lose back to the studies if i lose then i shall hide you. "Ige said as a small path opened up infront on the boy and ige stood there waiting, the fire began to disappera as it showed that ige was giving the first move to him. Zhandouji nodded excitedly. "It's a deal!!!" He shouted, pulling his bo staff from his back. [i]Once I win, this guy will keep me away from the stupid advisors so I don't have to study!!" He thought, ignoring just about everything else Ige had said other than the challenge. Zhan clapped his fist to the ground. "Obey me earth!! RAMPAGING QUAKE!!" He shouted, then the earth began to shake violently. Zhan obviously wasn't thinking of the fact that the guards might be drawn to the earthquake if they'd regained consciousness. As the earth shook below him, he ran at Ige with his staff, ready to swing at his head. "Sorry if this hurts!!" He announced, smiling with himself at his earthquake. Ige sighed as he jumped backwards as the earth started to rumble, it was nothing unless he had a combo in mind which he doubted. Ige started to have fire circle him then in case him, the fire went up fifty feet in the air as it disappeared and there stood Ige in his animal form. Fire was dancing off each wing and he looked as if a single match would make him a bird of fire. Ige looked down at the child as he slammed his wings on the ground making fire encircle the boy. He looked at zhan then took flight into the sky as he came in line with the sun almost blocking it out as he flapped his wings at zhan as feathers came off and fellow down towards him. He landed the instant he flapped his wings and breathed fire over the boy to scare him not harm him. Ige cocked his head to the side as he watched the boy see what he would do. Zhan took a breath. Humph, fine!! He thougth. "The earth will protect me!! Terra Shield!!" He shouted, as the ground came up and surrounded his body. The feathers all impacted on the shield, and the fire brushed the top of it. I'll attack from the inside!! He thought. "Fissure of Chaos!!" Zhan announced, slamming his palm into the ground below him. The earth shook viciously, a large fault in the earth appeared from the shield going straight at Ige. I still have something for back up if he avoids my fissure!! He thought, smiling to himself as his shield returned to the ground below. Description: The ground below Zhandouji shifts, and forms a shell of rock around his body. This can keep him from being harmed by most attacks. The shield is only penetrable by high-power attacks, and attacks it is weak to, meaning Wood. Description: Zhandouji slams the ground with great force, causing a large slit in the ground. If anyone falls in the fissure, they will be crushed by thousands of rocks, and spat back out after suffering severe injury. The attack is effective enough to break multiple bones in the body, but so easy to dodge it must be executed with skill. Ige flapped his wings and flew into the sky, he hated having to do this as he flapped harder and harder till he started to glide in the sky. He made fire come off his wings as he began to circle the boy, the fire reached down to the ground capturing the boy in the eye of a fire tornado. Ige flew faster and faster as he transformed back to his human state and hit the ground with a thud as he made sure the fire stood in check, he drew his sword and motioned for the boy to make the first move. "Come now, i demand that you fight me in here, your earth is limited and so is my fire since i am stuck making sure the tornado keeps going. I belive you might have a bigger advantage than me." 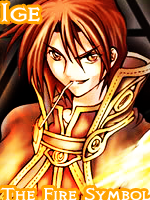 Zhan looked around himself, observing the fire tornado. Symbol of Earth, YELLOW DRAGON!!! Zhan thought, his inner thoughts booming heroically. Yeah, I'm a total beast!! He told himself, as his body transformed into that of the Yellow Dragon's. He spread his wings, and flew as his serpent body slithered through the sky. He turned, and dove at the ground, impacting the surface powerfully. The ground began to shake: Zhan had triggered an artificial earthquake. Though he could do so with his power, this took up less stamina. "Now, fear the Yellow Dragon!!" He shouted, his voice booming in his dragon state. He flew over the shaking earth, and transformed to normal just in front of Ige, swinging his staff at Ige's head. Ige smiled as the fire tornado stopped when zhan turned back to normal, Ige whispered to Zhan as the staff was just above ige's head. "Inferno, Ja Ne." A huge wall of fire erupted from ige hitting zhan making him fly back, it alerted the guards of his position. Ige smiled as the boy laided there burned all over, he turned his back and waved goodbye as he walked away. The guards came running and saw the area then looked at Zhan, they rushed to him trying to see if he was fine, Sir! Are you okay? How did you get Burn?! Someone go get a medic for him!"